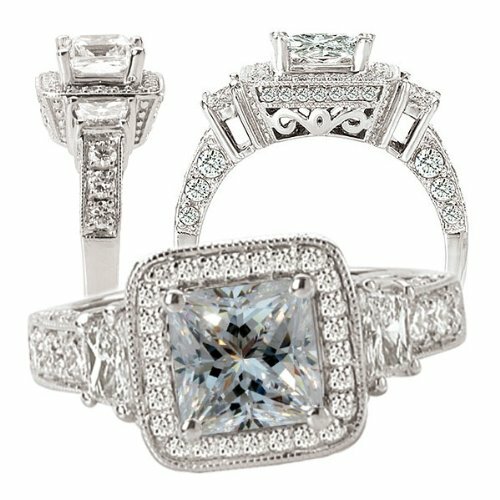 Emerald cut engagement rings are a little different than most other rings in both size and transparency. 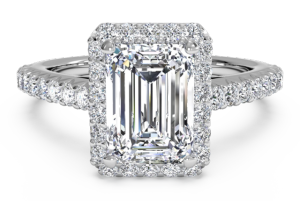 The emerald cut gives the stone a large central face, and four side faces that give the gemstone a gorgeous shine that allows the beautiful clarity of the stone shine through. The emerald cut is a perfect choice to showcase larger diamonds of high quality. 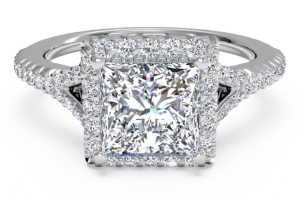 The cut itself is typically made from either a rectangular or square stone that is tapered at the edges. Below, is our list of our top ten, favorite emerald cut engagement rings. 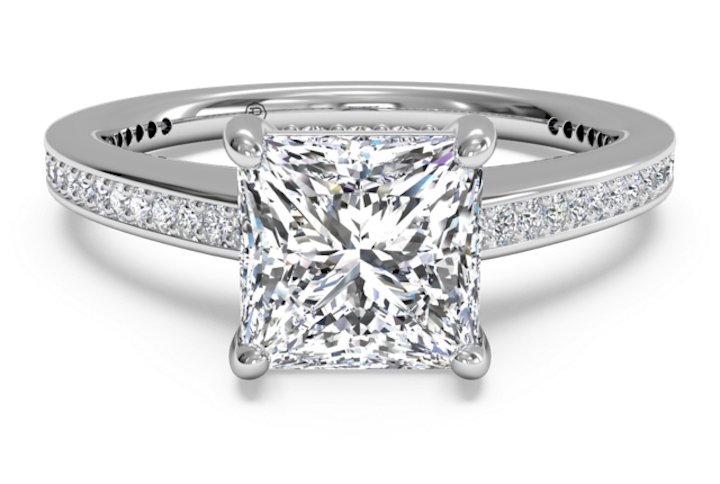 This gorgeous platinum ring features a 2.6 carat diamond with tapered baguette stones on the sides. This ring will look beautiful on any finger for many years to come. A matching wedding band is available with horizontal set baguette diamonds. Emeralds match well for a lady who likes green or who has green eyes. This stunning, emerald cut engagement ring features a large center diamond framed by smaller, round diamonds to give it some additional sparkle. 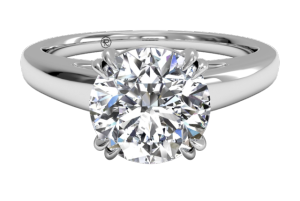 The stones are set in 14K white gold, and the ring has a total carat weight of 1 carat. There are many similar styles to choose from in case Kay happens to move this one out of production. 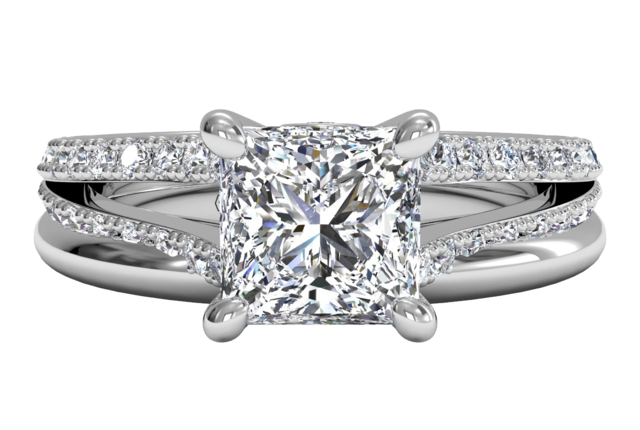 This exquisite 18K white gold engagement ring features sparkling diamonds in a “V” shape. The French setting allows more light to pass through the emerald cut diamond, giving it some additional sparkle. The minimum total carat weight of this piece is 0.24. This elegant, 18k white gold ring has a very modern look and feel with rows of micro-pave diamonds that twist around the center, emerald cut stone. This design is extremely unique and interesting, and the twisted setting allows the diamonds to sparkle and shine. There are plenty of micro-paved bands on the market today as the style is quickly becoming more and more popular. The French set diamonds on this ring are open on the sides which allows more light to pass through them, creating a little additional sparkle to highlight the emerald cut, center stone. The sides of the diamond setting has beautiful detailing to add a little extra pizazz to this beautiful 14K white gold piece. 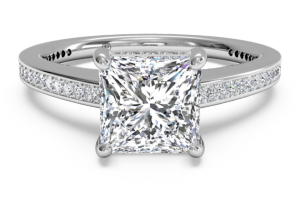 This beautiful solitaire, emerald cut, diamond engagement ring has a comfort fit band that is rounded on the inside. 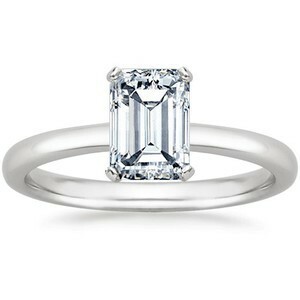 This classic ring has a 2mm, four pronged setting that holds the square, emerald cut diamond perfectly. 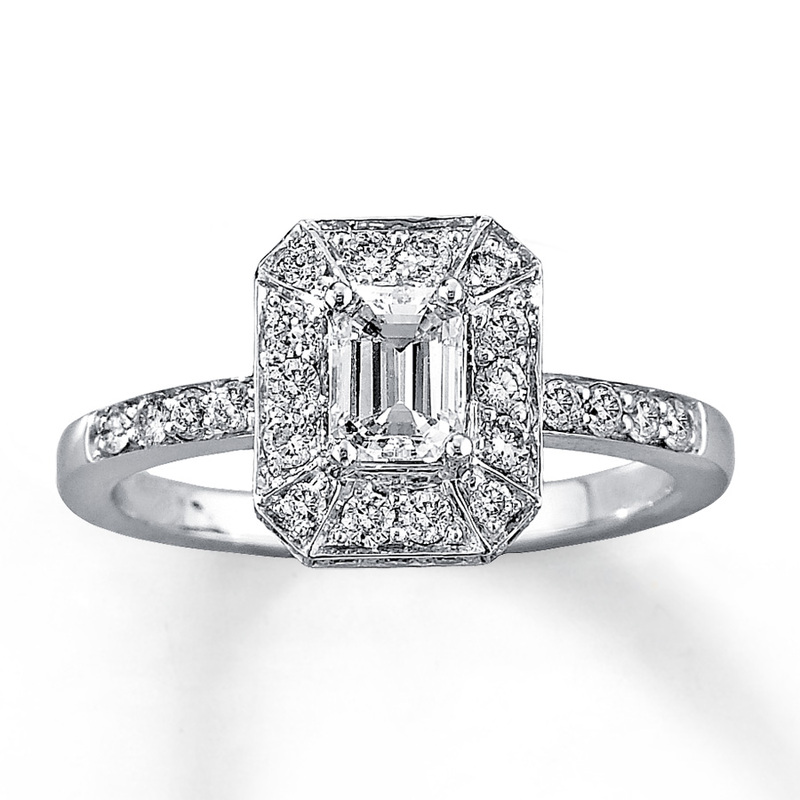 This regal, emerald cut diamond is absolutely beautiful. 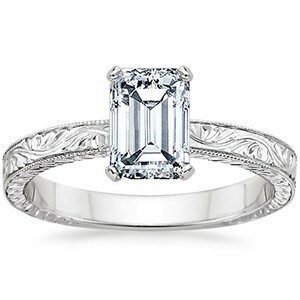 With long, clean lines, the emerald cut stone sparkles brilliantly. 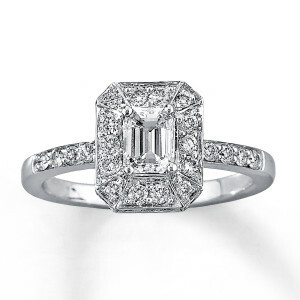 The center stone is accented by smaller, emerald cut diamonds, which gives the ring a very sophisticated look. This platinum engagement ring has a very simple, but beautiful design. 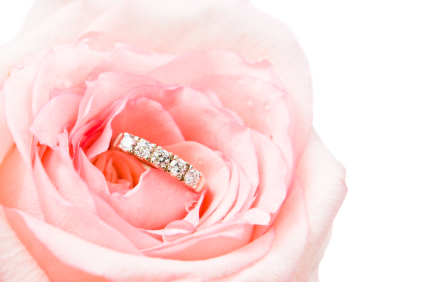 A setting, inspired by tulips has four prongs that gently cradle the center emerald cut diamond. The band is made with flat, airline edges, which create reflective edges and give the band extra shine. 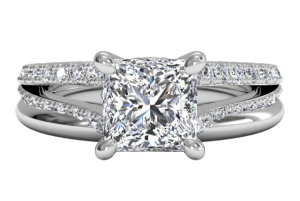 The prongs are also made from platinum to give the ring some additional strength. 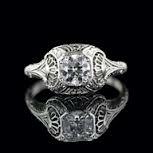 This gorgeous ring has a vintage look and feel. The band is exquisitely hand engraved with intricate scrolls and subtle milgrain on both the top and the sides, allowing the band to catch the light beautifully. 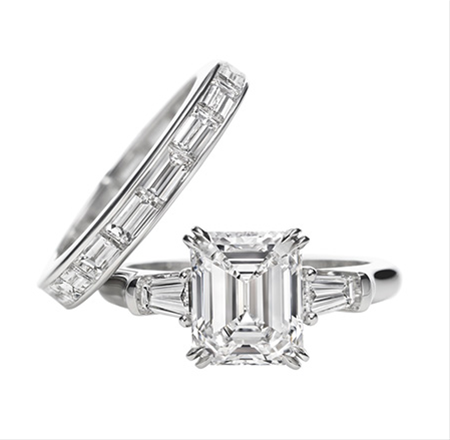 The single, emerald cut diamond is cradled in a four prong setting for additional strength. This ring has a sizing bar in the back, which allows for easy adjustments in the future. This 14K, white gold engagement ring features a row of French set diamonds in the band that sparkle brilliantly no matter how the ring is worn. 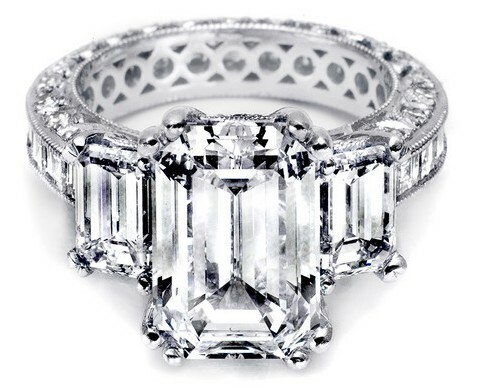 The center, emerald cut diamond is circled with a pave halo that adds additional shine and brilliance. This exquisite engagement ring is beautifully designed and will last a lifetime. 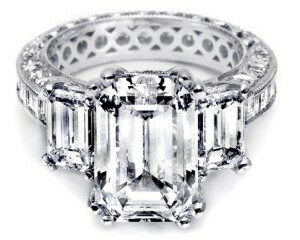 When purchasing an emerald cut engagement ring, you should be keep the four C’s of diamonds in mind. Carat, cut, clarity, and color, which can help you to choose a beautiful diamond.